At this price, DrumsSSX is well worth a look. An acronym for ‘Drum Signal Source Separator and Re-mixer’, DrumsSSX is a drum kit separation plugin that claims to be able to carve mono and stereo drum loops and tracks up into five constituent elements: Kick, Snare, Toms, Floor Toms and Cymbals. 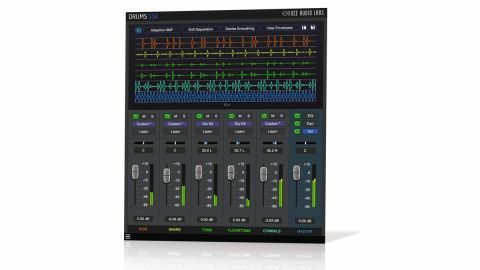 The interface presents the kit as a six-channel mixer (including Master), with per-channel level, pan, mute and solo controls, plus four-band EQ, transient shaping and saturation. Each channel is set up to tap off its named drum type, but there’s always a lot of crosstalk (the top of the kick drum appearing in the Floor Tom channel, for example), so you can’t kill unneeded channels without having a subtractive effect on the overall sound. The code doing the separation is a variant on the non-negative matrix factorisation (NMF) machine learning algorithm, and two NMF modes are provided: Progressive and Adaptive, the first doing the ‘better’ job of separation, but with increased artefacts. Three Separation modes enable balancing of crosstalk between channels and, again, artefacts; while the three-level Smoothing option can alleviate those same artefacts at the expense of transient definition. Each channel can be set to one of four algorithm-tailoring preset Kit modes - Rock, Jazzy, Dry and Metal. Most times, one will get the job done, but if not, activating Learn mode hones the algorithm for any given kit piece, with the caveat that it needs to be fed a fully-isolated hit from that piece for best results, which isn’t always possible. The plugin can unmix to a 5.1 configuration for routing each kit piece to its own channel in surround-capable DAWs. Although DrumsSSX can’t magically extract perfectly clean kicks, snares and hats from mixed kits, it does pull them apart enough to facilitate ‘remixing’, adjustment of reverberation and bleed, the generating of trigger signals, and a fair bit of creative experimentation. At this price, it’s well worth a look.